...some macabre things deserve to hang around all year. 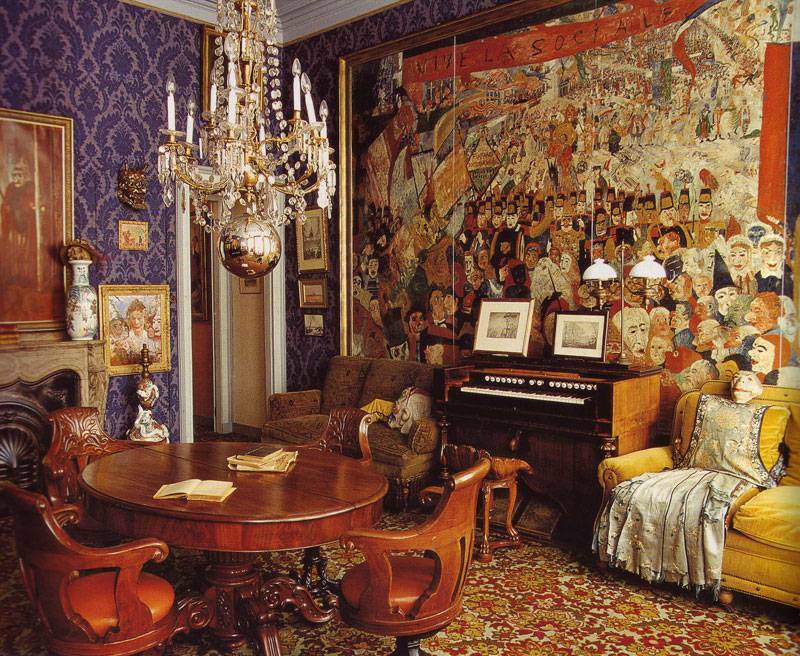 Like the paintings of Belgian artist James Ensor (1860-1949) and his GLORIOUS apartment in Ostend. 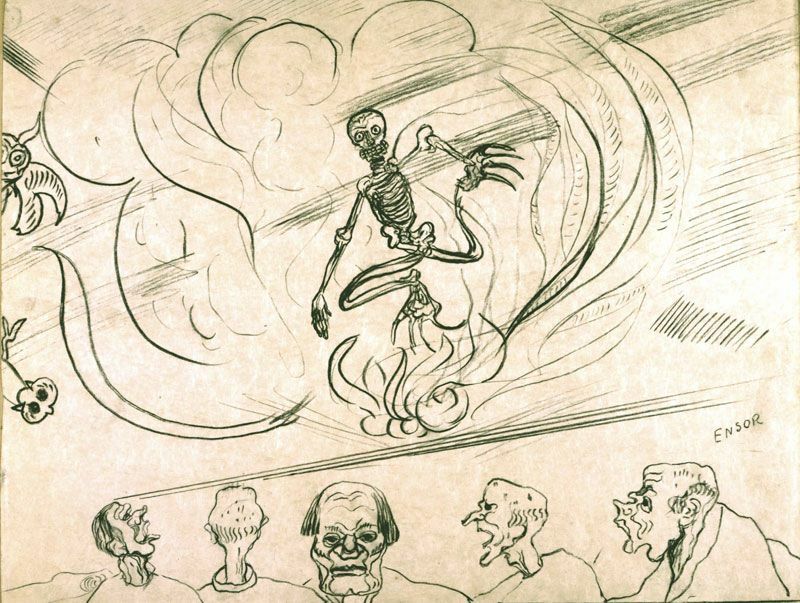 Above, The Banquet of the Starved, 1915. The Metropolitan Museum of Art. 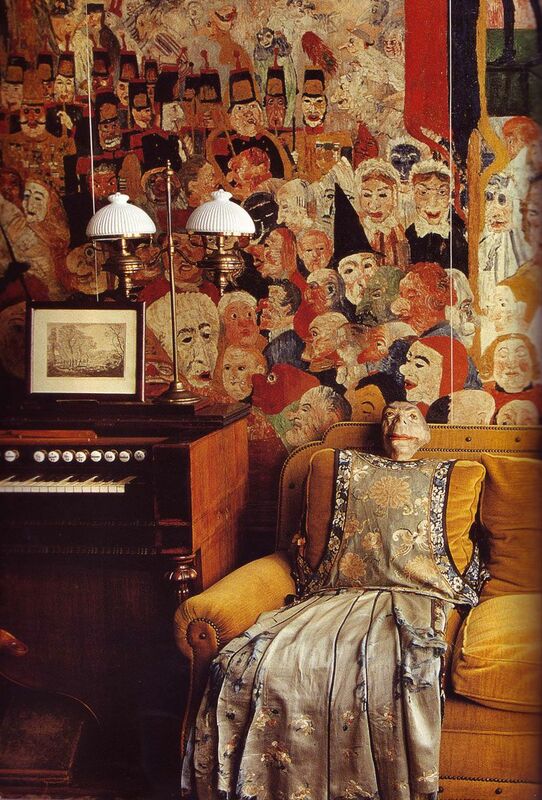 Ensor's family owned a curiosity shop (Ostend was a famed carnival resort-town), from which he drew much inspiration. (Look at all of the fantastic masks!) Of course, I'm apt to feel great affection towards anyone who dresses up their sofa and GIVES IT A HEAD. Below, an image of a shelf of masks from the souvenir shop. From one of his letters: "I spent my childhood in my parents' shop, surrounded by strange creatures of the sea, by magnificent shells of pearly iridescence, and by the bizarre skeletons of sea monsters and marine plants." In my parents' shop I saw the undulating lines and sinuous shapes of beautiful shells, the iridescent gleam of mother-of-pearl and the rich tones of fine chinoiserie, and above all the sea, vast and constant, made a profound impression upon me. 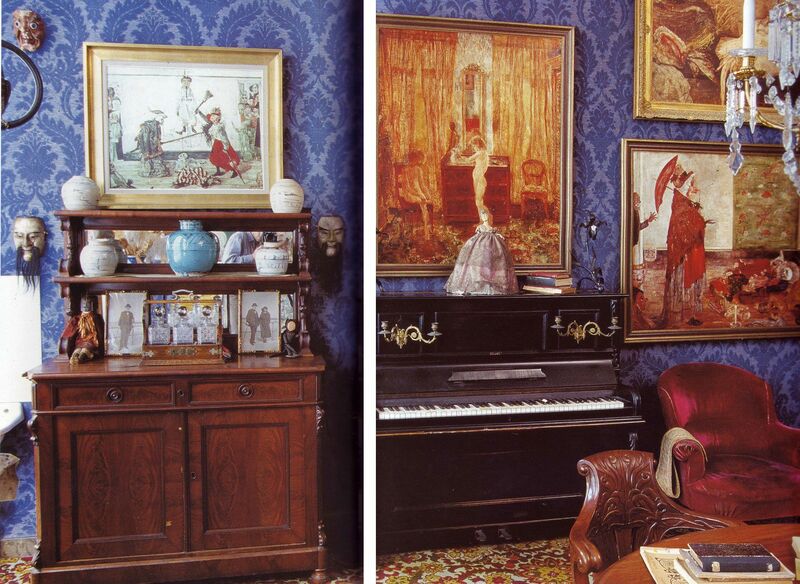 Scans and quotes from Artists' Houses by Gérard-Georges Lemaire, Photographs by Jean-Claude Amiel, 2005. This is pretty fantastic... his idea for that sofa is more than amazing. I'm sure some would go crazy in that apartment, but I love someone who is passionate enough to surround himself with things that inspire him. Those masks and paintings are disturbing yet though-provoking, which is probably what he's aiming for. Thanks for sharing this! Haute-Shopper- No problem! That's exactly why I love the apartment- you can CLEARLY see the source of his inspiration, and the way it interacts with his paintings. 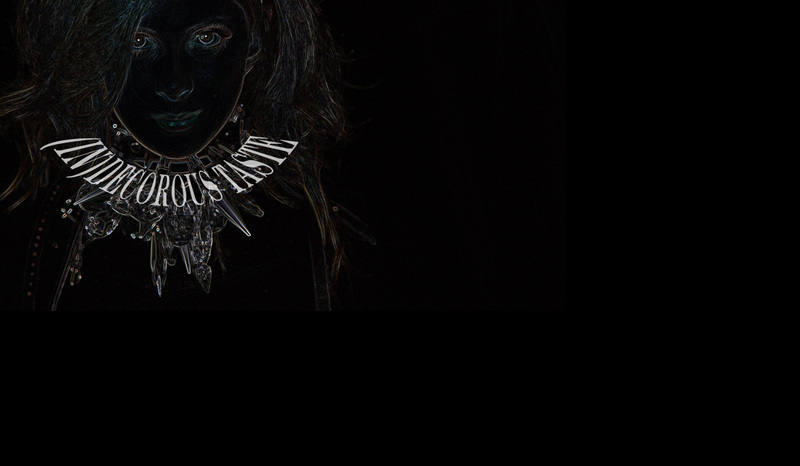 Couture Cookie- Oh my god, I know what you mean about the hand. It took me AGES to get used to the mannequin I have in my room. Definitely going to steal the idea of a witches ball as the bottom drop of the chandelier. 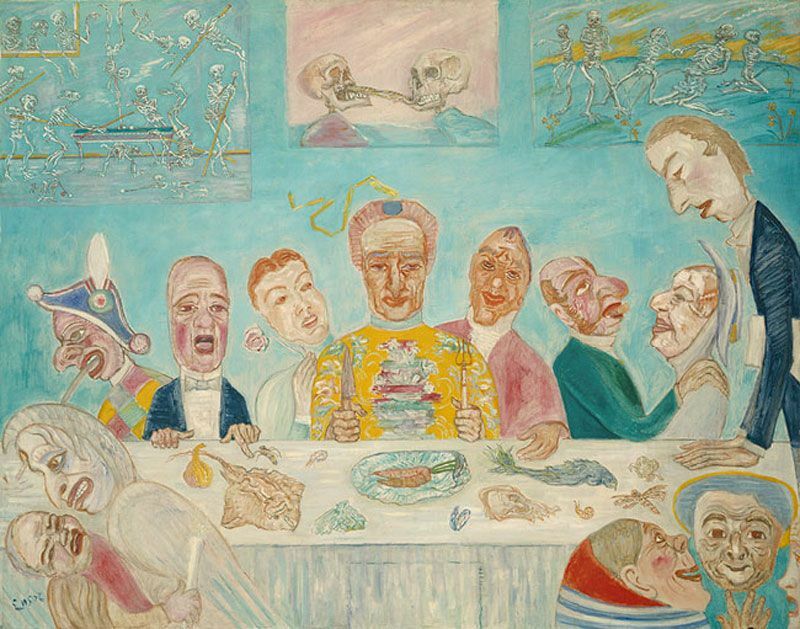 I was delighted to see your post about our Belgian painter Ensor!